Thespian Party | Theater | Style Weekly - Richmond, VA local news, arts, and events. While the New Year's ball drops, prospects for local theater are on the rise. Georgia Rogers Farmer had increasing success with three different cabarets at Richmond Triangle Players this year. When it comes to creating a cabaret act, Georgia Rogers Farmer says: "I have to do every job. I'm the director and producer as well as creator and performer. But I like being in control of it; it's a comfortable feeling for me." Farmer's been doing it with increasing success in Richmond during the past year. She's performed three different cabarets at Richmond Triangle Players theater, all of them playing to sell-out crowds. Her success has prompted the creation of "Ball Drop," a cabaret that she'll perform along with another local favorite, Chris Hester, on New Year's Eve. But cabaret's only one genre in which Richmond theater artists are finding new opportunities. This year saw a groundswell of locally developed theater pieces. The biggest splash was "Scorched Earth," the main-stage production of David Robbins' novel, produced by Virginia Repertory Theatre in April. A musical built around the songs of Joe Jackson premiered at Triangle this summer. And perhaps most significant was the near-constant stream of more experimental works produced by companies such as a collaborative group, TheatreLab, which then found their way to smaller venues such as the Shop. These are the shows that spotlight the burgeoning amount of local creativity and lend the city an air of theatrical emergence. Heather Falks, the events curator at the Shop, says one of the venue's goals is to give artists the opportunity to works on their rawest work. "We can provide a real launching pad for people developing original material," she says. The funky performance space located among warehouses south of Mayo Island started out reserving Sundays for theater pieces but has had to expand its availability to other days of the week to meet demand. Its most high-profile production was a new work by celebrated local writer and actress Irene Ziegler called "Ms. Palmer's Book of Penmanship and Civil Behavior" that Falks directed in August. The venue plans to open 2013 with a relative cavalcade of world premieres, starting in January with a new opera called "The Intricacies," developed by composer Matt Treacy. A play called "Osama the Hero" is sure to raise some eyebrows in February, but that's one of the other benefits at the Shop: a no-censorship policy. One of the most interesting projects at the venue in the summer was a musical workshop called "All Fall Down," for which audiences were invited to attend open rehearsals to see how the show was coming together before its final performances. The production was directed by Deejay Gray, the artistic director of TheatreLab, a co-operative company devoted to creating new work. Gray promises several more world premieres in the coming year, including a play he's writing. 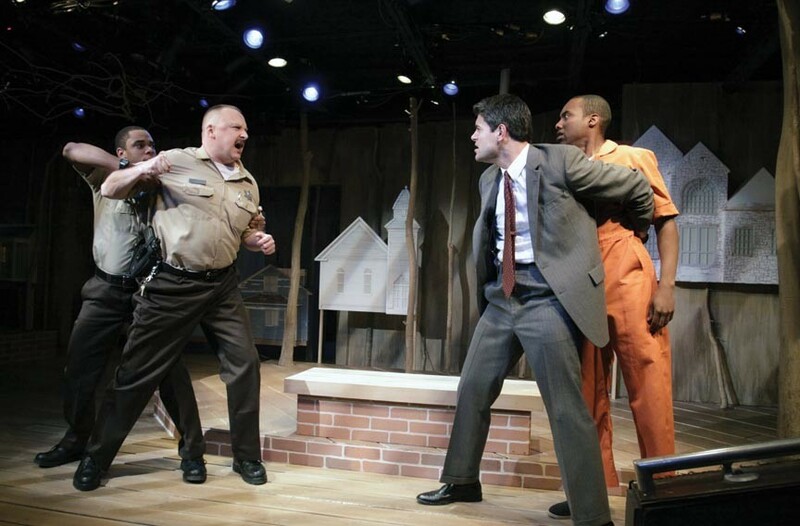 Actors Jeremy Howard, David Bridgewater, Adrian Rieder and Ronnie Brown throw down in Virginia Rep's "Scorched Earth," a production of David Robbins' novel. What's new in all of this activity, beyond the sheer number of new works being premiered, is that local artists such as Gray are feeling a sense of empowerment. Both writers and performers are seeing that their original pieces can make it to the stage. They're being supported by people such as Philip Crosby, the managing director at the Triangle, who says his patrons have encouraged him to keep the local talent flowing. "We've featured some well-known performers from the local theater community so audiences know they are in for a bit of a treat," he says. Farmer says many people have contacted her about getting started with cabaret. "There are a lot of incredible performers in Richmond and cabarets give them an opportunity to bring their personality out," she says. "I think it's great for this town." For tickets and information on the Richmond Triangle Theratre's "Ball Drop," call 346-8113 or go to rtriangle.org. Information on the Shop is available at facebook.com/theshopRVA and for TheatreLab at facebook.com/thetheatrelabRVA. To join TheatreLab's experimental conversation, go to theatrelabexperiment.boards.net.